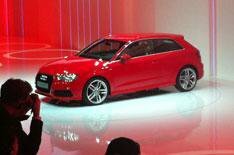 Geneva motor show 2012: Audi A3 | What Car? This is the new Audi A3, unveiled at a preview event ahead of the Geneva motor show. Due on sale in the UK in September, the A3 will face stiff competition from the new Mercedes A-Class, MK7 VW Golf and Volvo V40. The updated A3 looks externally similar to the model it replaces, albeit with a crisper, more angular front end. The new A3 also features a range of efficiency gains achieved through mechanical refinements and the use of lighter materials, including aluminium and high-strength steel. The cabin gets a major step up in quality, too, with a revamped dashboard layout and the latest generation of Audis infotainment systems. Audi has played it safe with the A3s external appearance. The cars sides get more surfacing than the outgoing A3s, with a particularly sharp crease (labelled the tornado line by Audi insiders) that runs from one end of the car to the other. The nose gets narrower headlights with LED flourishes that bring the A3 into line with the rest of Audis range. When coupled with the latest hexagonal grille, they give the car a more aggressive look. At the rear, meanwhile, theres a further evolution of Audis deeply scalloped hatchback design, an integrated roof spoiler, and LED tail-lights that stretch across on to the bootlid itself. The A3 will be launched with a choice of two petrol engines, a 1.4 TFSI with 121bhp and a 1.8 TFSI with 177bhp. The more modest of the pair has 148lb ft of torque and can take the A3 from 0-62mph in 9.3sec. It returns 54mpg and emits 120g/km of CO2. The 1.8 has 184lb ft and can crack 0-62mph in 7.2sec. Its combined fuel economy is 50.4mpg and it emits 130g/km of CO2. The diesel model, initially at least, will be a 2.0 TDI, with 141bhp, 62mpg, and 106g/km of CO2 emissions. However, before the end of the year a 1.6 TDI will be added to the range, offering 99g/km and combined fuel economy of 74mpg. 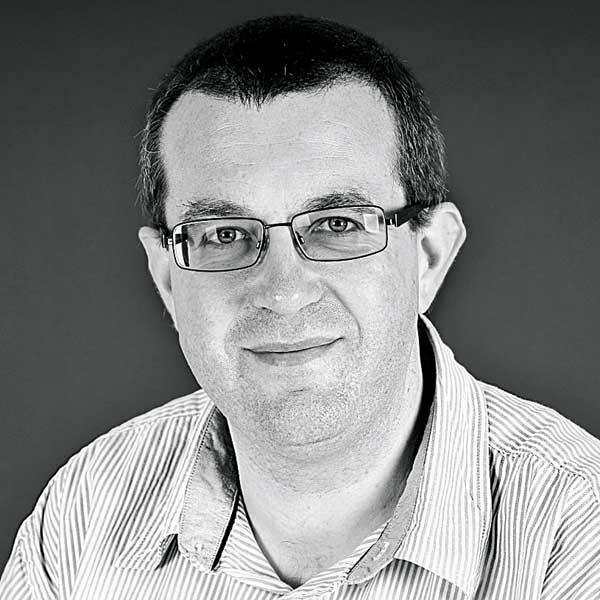 Further engine options, including a 2.0-litre petrol and a 1.4 petrol with cylinder-deactivation technology, which cuts out some cylinders when the engine is running under a light load, will appear in the first half of 2013. All of the launch engines will feature stop-start and brake energy-recuperation as standard, and get a six-speed manual transmission. However, Audis dual-clutch S-tronic gearbox will be offered as an option across the range. Itll have seven speeds on front-drive models but only six when fitted to four-wheel-drive variants. Driver aids on offer include adaptive cruise control, an emergency braking system to avoid low-speed collisions, lane-keep assist and a revised auto-park feature that can steer the car into supermarket spaces as well as parallel parking. Whats the A3 like inside? The front cabin has a fresh layout and an airy, spacious feel, thanks to the adoption of an electronic handbrake switch instead of the traditional lever, and the decision to move the infotainment screen to a floating position at the top of the dashboard. Even the basic stereo will be mounted on top of the dash. However, the most popular choices are likely to be the two levels of MMI infotainment systems. The first has a 5.8in monitor that slides up out of the fascia; it can be turned into a navigation system at any point if the customer decides to retro-purchase a suitable SD card from their Audi dealer. The range-topping MMI Navigation Plus includes a seven-inch screen again retractable plus a 60Gb media centre, a DVD drive and voice control. The system can also use your Bluetooth mobile phone to access Google Earth and Street View. Audis engineers have also integrated this systems touchpad (first seen on the current A8) into the top of the rotary control, saving even more space on the centre console. How much will the new A3 cost? Audi has yet to confirm pricing for the new A3, but wed expect only a modest increase over the current models figures. That means the base 1.4 TFSI model should start at around 18,500, allowing scope for a cheaper 1.2 to arrive in 2013. The 2.0 diesel should cost around 20,500, while its 1.6-litre brother should start at around 19k. The five-door Sportback and Cabrio will continue in their current forms for at least another year, and the drop-top could be forced to soldier on for longer than that. Theyll be joined by a small saloon version, too. Itll be aimed at undercutting larger four-door rivals while offering a more premium cabin.